Physical Copies Of Independent Powerhouse Sampler Hit The Streets! 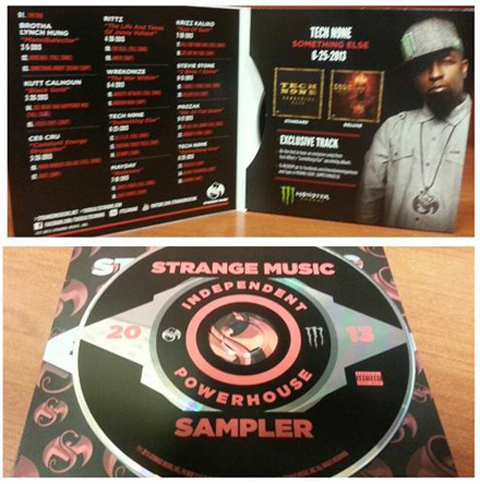 In an attempt to help fans fathom the massive amount of releases being put out by Strange Music this year, label CEO Travis O’ Guin commissioned the Independent Powerhouse Sampler, a compilation featuring tracks from every 2013 Strange Music release. Aside from a surprising peek into Tech N9ne’s upcoming album Something Else, the sampler also contains tracks from Wrekonize, Rittz, Brotha Lynch Hung, ¡MAYDAY!, and more! Not only is the sampler up for free download, but Travis just unveiled to HipHopDX recently that he printed 500,000 physical copies, which will also be given out for free on the tour with the same name! In another F.T.I. 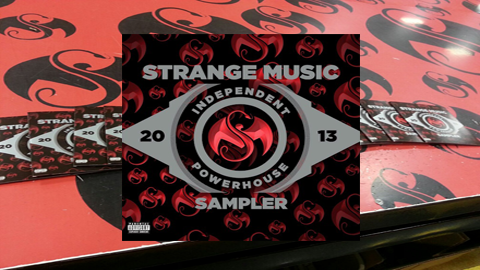 move, Strange Music Street Teams across the nation have begun delivering physical copies of the Independent Powerhouse Samplers to establishments in every city they can hit! These samplers truly are the best way to get the point across. It’s not like a poster or a flyer where you see it and you don’t really know what to expect. You can put this in your stereo immediately and know exactly what you’re going to get. We’re spreading these things literally EVERYWHERE – record stores, gas stations, restaurants…anywhere that’ll take ’em, so keep an eye out. And if you see a Strange Music vehicle riding around, flag us down! We’ve always got some on deck. So if you can’t make a date on the tour, check around your city for copies of the sampler, and if you find them somewhere, take a picture and let us know! We’ll be compiling a list of places in each city that have copies in stock. Until then, download a digital copy HERE. Which 2013 release are you most hyped for? Would you like to see more samplers like this in the future? What’s your favorite track on the sampler so far?